Published on December 9, 2013 8:25 PM by dbo. Coming up on Wednesday, December 11 will be the 104th anniversary of the second historic Canadian/American football exhibition. The first took place when Harvard hosted McGill in 1874 and two forms of rugby were demonstrated, to develop independently in each nation over the next 35 years. While there may have been other displays of the football brands in the years between, the next notable exhibition took place in Dec., 1909 when the Ottawa Rough Riders and Hamilton Tigers showcased our game in New York. In 1909, what would become known as the first Grey Cup game was played on Dec. 4 in Toronto, with the University of Toronto capturing the first Dominion championship to receive this new trophy. A week later, on December 11, 1909, two and three weeks after their seasons ended, the Ottawa Rough Riders and Hamilton Tigers squared off in an exhibition game at Van Cortlandt Park (cricket grounds, presumably) in New York, NY. 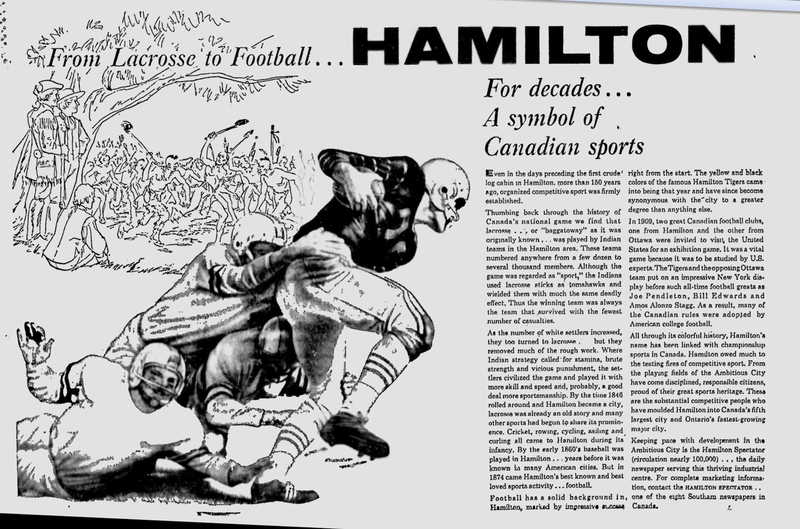 The match was arranged by the New York Herald newspaper in an effort to showcase the Canadian style of game and rules to the American public and key American football officials, who were under pressure to change their game or have it banned due to numerous high profile injuries and deaths that had occurred during football games in the previous months. New York public schools had already taken the step of banning football from their programs starting in 1910. This announcement came as the Canadian teams prepared to leave for New York (see also headline below NY Schools to Quit It). The Herald’s showcase of the Canadian game to the American public and college football officials was to start discussions on changes to the game rather than be banned outright. The paper’s interest in preventing the banning of the game, in as much as they staged the game at their own expense and charged no admission, was perhaps in that football news and scores sold papers. The Herald initially invited the Ottawa Rough Riders and the University of Toronto Varsity club, but Varsity officials declined to go (though the players were willing) and the Tigers were substituted in their place. Ottawa and Varsity squared off in the playoffs Nov. 27 with Varsity advancing to the Dominion Championship. Ottawa had defeated the Tigers earlier in the playoffs as the top two teams in the IRFU senior loop. Canadian officials and press were certain the invitation was an expression that the Canadian rules were a safer and better brand of football. Canadian death and injury rates were lower it was believed, though the publicity that incidents received in the US along with the discrepancy in participation made it hard to compare. The games had some similarities, but differed widely in their appearance. Both brands used the scrimmage to put the ball into play and 3 downs to gain 10 yards, but American football had introduced the forward pass with restrictions (the forward pass wouldn’t be adopted on a limited basis in Canada until 1929). Both fields were 110 yards long but Canadian rules provided for four 15 minute quarters while American college teams decided on the game length each game, not to exceed two 45 minute halves. The Canadian style of play, still called Canadian rugby or just rugby, were similar to rugby in that, without the forward pass, kicking was much more prevalent in the game. The Herald’s competitor, the New York Times, reported that in addition to showing the advantages of the Canadian game, there was some interest in unifying the two North American football codes to allow for international matches (see Canadian Football Match, New York Times). As we know, this never occurred, though they continued to evolve in step to remain similar in nature, and future exhibition matches were held using either Canadian or American rules or a half of each. With part of the Herald’s enticement to the Canadian squads to participate, a high level of interest and a venue with a capacity of 50,000 to 60,000 persons was indicated. In the end, 20,000 spectators watched the Hamilton Tigers get their revenge on Ottawa by an 11 to 6 score. The result was viewed with great interest from those who came to see this game. The opinion was that, though it had its vagaries, some of interest and some regressions, it resembled the game American college football had evolved from. Overall, however, the differences of sport between the two societies was thought to represent the differences in the games. More than anything else, a comparison between the two games must be one of National temperaments and ambitions. Playing a game merely for the sake of playing it does not appeal to many on this side of the water and south of the Canadian border. Seemingly, the Canadians are, like their British cousins, amply satisfied with the indulgence in sport regardless of the end achieved. Others were blunt in their criticism and called Canadian football crude. Canadian reporters soliciting opinions from the American football executives and experts in attendance received split opinions on the Canadian version. Some rejected it outright, others saw good and bad portions of it while others agreed it was more open. Officials were under much pressure to change their game, even when they did not agree in its danger, and being asked to accept a much different game after one viewing must have been difficult. While nothing was decided, the process amongst American colleges to reform football had already begun before this exhibition. Yale President Hadley, Harvard President Lowell, Walter Camp, “father of American football” and Percy Haughton, Harvard football coach, had already met to discuss the situation. The reform was felt to be in good hands. In the end, the Canadian display had little or no influence on rule changes adopted for the 1910 US College football season. The biggest change made for player safety was the elimination of the flying tackle. A reduction of injuries quieted the uproar in 1910. The exhibition game between the Canadian teams receives no mention in the American history of the 1909-1910 football crisis. However, in Canada, it was still an event to be remembered nearly 50 years later and today still. In 1909, two great Canadian football clubs, one from Hamilton and the other from Ottawa were invited to visit the United States for an exhibition game. It was a vital game because it was to be studied by U.S. experts. The Tigers and the opposing Ottawa team put on an impressive New York display before such all-time greats as Joe Pendleton, Bill Edwards, and Amos Alonzo Stagg. As a result, many of the Canadian rules were adopted by American College football. An interesting piece of history from a number of perspectives, one being the pressures facing the leagues today over player safety and necessary rule changes. History of Note: Dec. 11, 1909 was published on December 9, 2013 8:25 PM by dbo. This article is categorized under Game and tagged with hamilton-tigers, history-of-note, ottawa-rough-riders and rules.